Joint operation planning consists of planning activities associated with joint military operations by combatant commanders (CCDRs) and their subordinate joint force commanders (JFCs) in response to contingencies and crises. It transforms national strategic objectives into activities by development of operational products that include planning for the mobilization, deployment, employment, sustainment, redeployment, and demobilization of joint forces. It ties the military instrument of national power to the achievement of national security goals and objectives and is essential to securing strategic end states across the range of military operations. Planning begins with the end state in mind, providing a unifying purpose around which actions and resources are focused. Joint operation planning provides a common basis for discussion, understanding, and change for the joint force, its subordinate and higher headquarters, the joint planning and execution community (JPEC), and the national leadership. 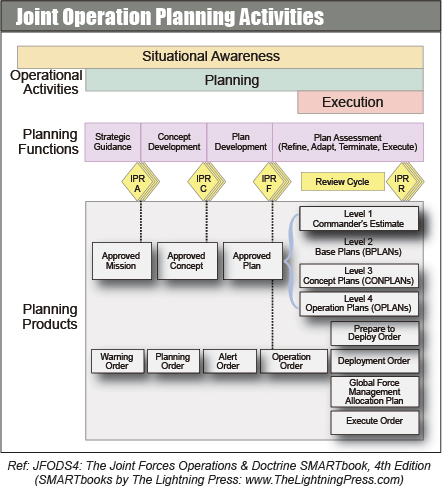 The Adaptive Planning and Execution (APEX) system facilitates iterative dialogue and collaborative planning between the multiple echelons of command to ensure that the military instrument of national power is employed in accordance with national priorities, and that the plan is continuously reviewed and updated as required and adapted according to changes in strategic guidance, resources, or the operational environment. Joint operation planning also identifies capabilities outside Department of Defense (DOD) required for achieving the strategic objectives to reach the end state by providing a forum that facilitates the inter-organizational coordination that enables unified action. The pursuit and attainment of the US national strategic objectives in today’s environment requires critical and creative thinking about the challenges facing the joint force. Joint operation planning fosters understanding, allowing commanders and their staffs to provide adequate order to ill-defined problems, reduce uncertainty, and enable further detailed planning. The planning process, both iterative and collaborative, enables understanding and facilitates the development of options to effectively meet the complex challenges facing joint forces throughout the world. The body of knowledge and understanding created during planning allows JFCs and their staffs to monitor, assess, and adapt to uncertain and changing environments and to anticipate and proactively act in crisis situations. Joint operation planning produces multiple options to employ the US military and to integrate US military actions with other instruments of US national power in time, space, and purpose to achieve national strategic end states. Achieving operational military victory may be only a step toward achieving the overall national strategic goals and objectives, as demonstrated by events in Operations IRAQI FREEDOM and ENDURING FREEDOM. Additionally, planning identifies and aligns resources with military actions, providing a framework to identify and mitigate risk. Joint operation planning consists of planning activities associated with joint military operations by combatant commanders (CCDRs) and their subordinate joint force commanders (JFCs) in response to contingencies and crises. It transforms national strategic objectives into activities by development of operational products that include planning for the mobilization, deployment, employment, sustainment, redeployment, and demobilization of joint forces. IPRs constitute a disciplined dialogue between commanders and their higher headquarters and are a part of the formal adaptive planning review and approval process for campaign and contingency plans. Plan development will include as many IPRs as necessary. Topics for discussion may include clarification of the problem, strategic and military end states, military objectives, confirmation of intelligence and the operational environment, mission, facts and assumptions, courses of action (COAs), capabilities and force requirements, areas of risk, identification and removal of planning obstacles, required supporting and supported activities, guidance on coordination with the interagency and multinational communities, and the resolution of planning conflicts. Further, IPRs generate valuable feedback for planning staffs and provide a common vision between national and military leadership.